It's been a long week. Lots of stress and little joy. Annie's dad has been very ill and we travelled up to Welwyn this week to see him in hospital, where he has been for the past couple of weeks. Fingers crossed he gains enough strength to get back home soon, where he will feel happier and more likely to make progress back to health. Work has been a bit sporadic so I've made a decision, a la Jonathan Lethbridge – of Wanstead Birder fame – to make a return to Canary Wharf. I'll be freelancing at Racing Post for a while. I worked at the Post full-time for ten years between 1987 and 1997 when it was owned by Sheikh Mohammed and was based at Raynes Park, before I moved on to Haymarket Publishing and Motoring News, later to be renamed Motorsport News. About six weeks after I left the Post it was dramatically sold to Trinity Mirror and relocated to 1 Canada Square. I went back to the Post in 2005 to work as a freelance on and off for a few years and will probably start working there next month. With the work I do for the Racehorse Owners' Association and for Anderson & Co – who published a couple of quarterly racing publications – I'm not going to get much time off. It will mean any birding forays will have to be organised for earlier mornings – and I don't do early starts very well (I always stay up too late). The timing obviously isn't that great with the spring migration about to go into full swing, but needs must. It had been a bit quiet at Holmethorpe, apart from the drake Scaup making a return to the site, plus a few Sand Martins, a Med Gull and a couple of Little Ringed Plover – none of which I have seen. Still no Wheatears, but one or two should turn up soon, maybe next week when the weather turns. Then on Tuesday I got a text from 'Devilbirder' David Campbell at Canons Farm – a male Black Redstart had been seen near the farmhouse in the late afternoon by Kevin Hazelgrove. He found it himself shortly after 4pm and I ventured over for about 5pm. I'd been over at the Farm on Monday looking for Lesser Spotted Woodpecker and hadn't really seen very much apart from a jogger and trotted past in the sunshine. This in itself wouldn't have been worth commenting on if it wasn't for the fact this old chap, resplendent with ginger beard, was running around in the countryside in nothing more than a pair of underpants, normal socks and a pair of tatty old trainers. Not something you see every day. I sent out a Tweet and David Campbell soon responded: "LOL!!! That's pantsman! Haven't seen him for a while. That's made my day". Back to Tuesday and I met up with David just as the Black Redstart, that had recently been perched on a fence post, had flown off. He had to leave so I stayed on, and on. And on. Nothing. Not a thing. By 7pm, it was time to leave. By this stage, John Benham had arrived, and just as I was about to go to my car he called out that he was on to it – perched on the footpath sign. I saw the bird briefly but couldn't get the scope back up and pointed at it before a dog walker appeared and it disappeared. It wasn't enough to confirm what it was. By now it was getting dark, like my mood, so I left. This little bird was clearly elusive and a bit of a challenge. A female Black Redstart was seen yesterday when I was visiting my father-in-law (the same day a Bittern appeared out of nowhere at Beddington, and three Lesser Spotted Woodpeckers and a Red Kite were seen at Canons Farm) and fortunately it stuck around yesterday. 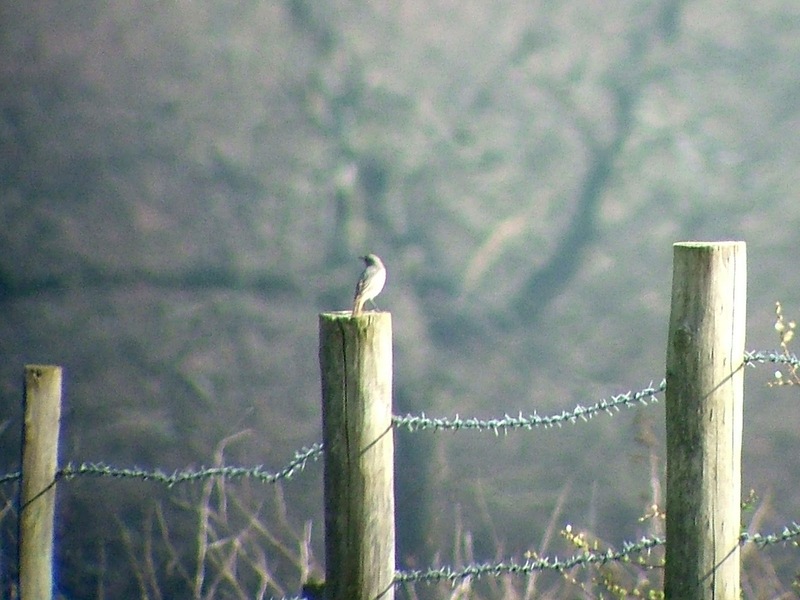 I went back up to the farm just before midday, and within a few seconds of turning the corner towards the viewpoint to the west side of the farm buildings, I saw the female Black Redstart (111), perched on a metal post. It saw me too and opted to fly further down the fence, but stayed long enough for me to get a record shot of it. It's Annie's birthday today, so I won't be out on the patch or anywhere else for a couple of days. Hopefully, with the weather about to cool and the wind direction about to change, it will mean a few decent migrants will arrive at Holmethorpe and elsewhere nearby. 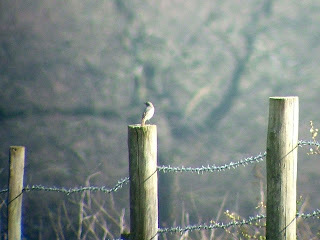 A Wheatear or a Ring Ouzel perhaps? Neil, hope Annie had a nice birthday despite her Dad's poor health. Hope he gets back home soon. By the way if ever you get back over to Tilburstow Hill do pop in at Stansted House, I'll give you a tour of our workshops.